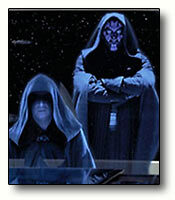 DMEB-2: The Sith: Information about the Sith, their Order and History. The Sith. A long and dark subject. They are an evil order of black magicians, sorcerers who bend and twist the Force to their own ends, to control what they may. They are no less warriors than the Jedi, who also may be called witches, but the Jedi use the Force in a different way. To enhance peace and harmony. Or so they say. The Force itself is a neutral entity that pervades the galaxy, perhaps even the Universe itself. It is how it is used that counts.